Love our maps? Come unwind with our Sip-n-Create trail map crafts. Join the Trail Conference and our friends at Merrell as we re-purpose our out-of-date trail maps and give them a new purpose! We’ll provide the drinks, the art supplies, and maps! No artistic skills required – our crafty cartographer will instruct step-by-step instructions. Warm up with Merrell’s Hot Cocoa Bar, while viewing our latest art exhibit at Trail Conference headquarters. Mix and mingle amongst other trail enthusiast and leave with a piece of the trail with you! Choose your map set: Trail Conference maps are built on more than 80 years of mapping experience. Our maps are "Made By the People Who Build the Trails" and are regularly updated with changes to the trails. Quantities are projected to back up with the new release. 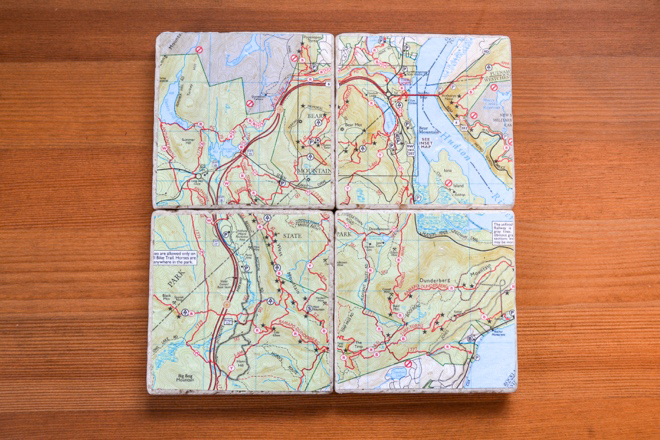 There is no better way to re-purpose our maps than a keepsake of your favorite trails! In between crafting, try on a pair of Merrell Cold Pack Ice+ Mocs (available in Women’s and Men’s) to test out the new innovation Arctic Grip technology for variable winter conditions. A demo ice ramp will be available to compare your shoe traction to that of the grip technology!